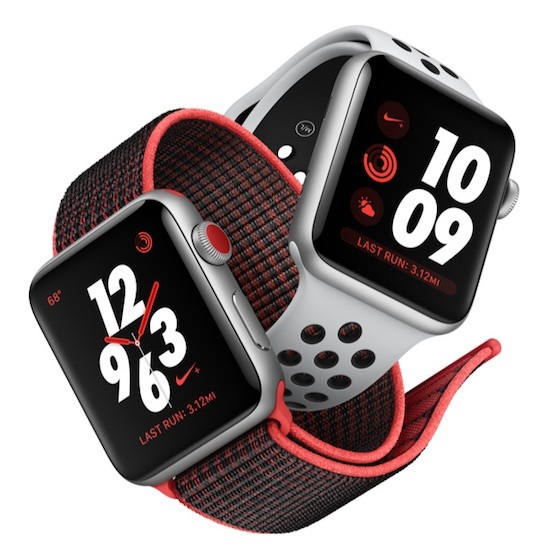 Just ahead of the launch of the Nike+ Apple Watch Series 3 models, which will be available starting this Thursday, Nike has updated its official Nike+ Run Club app with new functionality that was highlighted on stage during Apple's September event. On both iPhone and Apple Watch, Nike+ Run Club is gaining Audio Guided Runs, which are a series of guided workouts from Nike coaches and athletes like Mo Farah and Kevin Hart. Runs are paired with a playlist that can be used with streaming music services. Audio Guided Runs can be accessed on Apple Watch by opening the Nike+ app on the watch and then scrolling down under the Start button. Runs will need to be downloaded on the watch ahead of time. Along with Audio Guided Runs, Nike is introducing a "Cheers" feature that lets users notify their friends when they go for a run to get cheers in response for motivation. There's also an updated Activity History feature on Apple Watch that displays the details of the last five runs, and on Apple Watch Series 3 models, elevation data is now available on standalone watch runs. The Nike+ Run Club app can be downloaded on the iPhone and all Apple Watch models, but with Nike+ models, there's an option to launch the Nike+ Run Club app from the exclusive Nike watch faces. Since when Kevin "obnoxious" Hart is an "athlete"? He’s a big advocate for running. About damn time. The Watch wouldn't properly mirror my iPhone since I installed iOS 11. My Nike series 3 Watch was shipped today to deliver tomorrow. Good to know they are updating the app ahead of time. So now you’re back to Garmin? No, I have been using the Apple watch with the workout app and it is very accurate. Now I have a series 3 and it seems even more accurate. My comment was on the Nike app and how I wish it was better for all that they hype it. It does show those...errr used to just fine in WatchOS 3 & iOS 10..but since the latest update things have been super wonky and all out of wack. Hopefully this app update realigns everything in proper working order. I was having issues with my Nike+ Watch and RunClub app after OS4 and ios11. Talked to Nike support on the phone and got reply next day asking me to hard reboot both watch and phone (they called it soft reboot - in any case it’s when you hold down 2 buttons til device resets and Apple logo appears). Thus fixed my issues - which were app crashing and inconsistent mile tracking - related to gps they said.